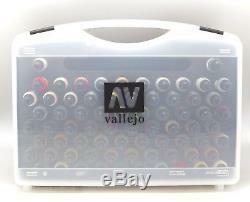 Acrylicos Vallejo Basic Colors Model Airbrush Paint Set, Case And Brushes, 72 Colors. Colors can be mixed with one another. 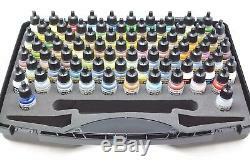 Vallejo Suitcase Model Airbrush Color Basic Hobby Colors (72 paints and 3 brushes). 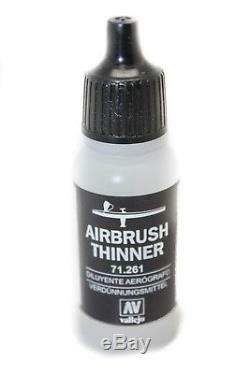 This is not for brush painting although paint brushes are included to for touchup after airbrush use. The consistency of Model color allows for an extremely smooth and uniform paint film, with no trace of brushstrokes. Professional model painters always work with a wet brush and dilute the paint with water or Mat Medium, applying many thin layers to achieve depth and shadows. Colors may also be diluted with other Mediums for glazes and layered applications. The water based formula of Model color has been specifically developed for adherence on difficult surfaces such as metal and plastic, but the product is not toxic, not flammable, and does not give off noxious fumes. Errors can be corrected immediately with water or alcohol Model color dries quickly to a matte, even and waterproof finish. Exact drying time depends on the temperature and humidity of the environment, on the surface which has been painted, and on the thickness of the paint layer - although the colors are dry to the touch within minutes, the water content keeps on evaporating, and the paint does not acquire its true permanence until several weeks after application. 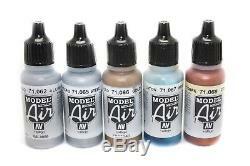 Vinyl acrylic colors, very highly pigmented, formulated for models and miniatures. 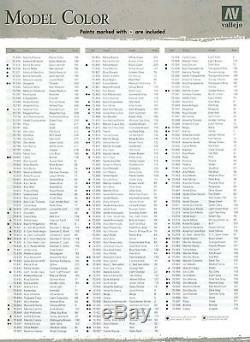 Model color is indicated for all surfaces, and especially formulated to adhere to plastics and polyesters. 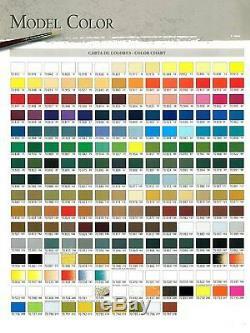 MODEL COLOR'BASIC COLORS' PAINT SET INCLUDES. Orange Fluorescent Brass Scarlet Off White. German Camouflage Orange Ochre Lime Green Gloss White Cork Brown. Brown Sand Mahogany Brown Dark Sand Black Glaze. Glossy Black Gunmetal Grey Grey Green Medium Sea Grey. Chocolate Brown Old Gold Green Brown Silver Grey. Brown Violet US Olive Drab Retractive Green Intermediate Green. US Dark Green Gunship Green Dark Prussian Blue Pale Grey Blue. Carmine Red Vermillion Yellow Ochre Green Ochre. Beige Ivory Foundation White German Uniform. English Uniform Red Dark Flesh Dark Blue. Transparent Red Saddle Brown Black White. Lemon Yellow Flat Yellow Clear Orange Flat Red. Purple Sky Blue Medium Blue Prussian Blue. Deep Green Green Grey Black Green Orange Brown. Cavalry Brown Flat Earth Flat Brown Sky Grey. Dark Sea Grey Neutral Grey White Grey German Grey. Silver Bronze Copper Gloss Varnish. 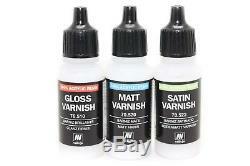 Matte Varnish Metal Medium Satin Varnish Thinner. If you have any questions. We stand behind our products. Having said that, please understand we cannot take everything back if you do not like it. We appreciate your interest in our products and hope we can earn your business. Thanks again and please check out our other auctions as well! We do not cover this cost. The item "Acrylicos Vallejo Basic Color Model Air Brush Paint Set Case 3 Brushes 72 Colors" is in sale since Friday, September 08, 2017. 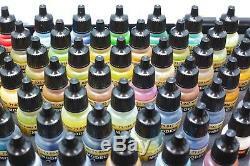 This item is in the category "Crafts\Art Supplies\Painting Supplies\Airbrushing Supplies\Airbrush Paints". 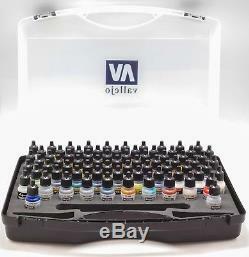 The seller is "bjg_deals" and is located in Rancho Cucamonga, California. This item can be shipped worldwide.